Okay, let's be honest. How many fashion bloggers here have worn uncomfortable shoes just to make their outfits more...blog worthy? When I first started blogging, that's what I did! I still occassionally do, although I prefer to remain as true to the original outfit that I actually wore out. However, I decided I might as well come clean and depict what occured. See those cobalt blue boots? Much more practical for a day of classes! Just a short little heel that's easy to prance about on campus. However, these black boots I switched to for the pictures are definitely more "night out" appropriate and make my legs look killer. Not to brag or anything, but come on, there's a reason every girl needs to have a good pair of heels, and this is it. So, in a lengthy manner of putting it, I'm showing you how I'd take this outfit from day to night! I mean, I'm already wearing leather leggings for day, it's not too hard to make it transition to a night time look. Also, DAT HAIR! Haha, I'm so pleased with how pleasantly deep red it showed up in these photos. I'm still not used to it! Everytime I pass a reflective surface, I can't help but peek to catch a glance of my fiery strands. Its probably the deep blue of this blazer that makes it stand out more, so I'm definitely going to be playing with that color more! So now that I've actually dyed my hair from roots to tip, I'm so concerned about color loss! I'd hate to have this fade on me. So what'd I do? I went out and bought about 5 different products dedicated to color protection. That crap gets expensive though! That quote about going through pain to be beautiful forgot about the broke part. with a repertoire for art, fashion, and the mundane. arachnids and loss of family make up a good chunk. thrift for one-of-a-kind finds, and travel is always a must. and say: "Wherever you point is where I strode." is something I consider a worthwhile challenge. and so is a loose tongue, so before you speak, please stop. until then, I'm just a dreaming girl named Greaves. Well, I have definitely worn (and still own) uncomfortable shoes but it's because I think they are so beautiful (and cheap) that I couldn't resist. :) Clothes on the other hand...I have definitely bought some because it was what "everyone else" was wearing, but in the end I'll have to admit they're just not me. The cobalt blue shoes totally rock. But I totally get it, the black boots really look awesome and make your legs look longer. Your hair looks sensational in these photos Linda, a colour protectant shampoo and treatment will help keep it looking this fiery. 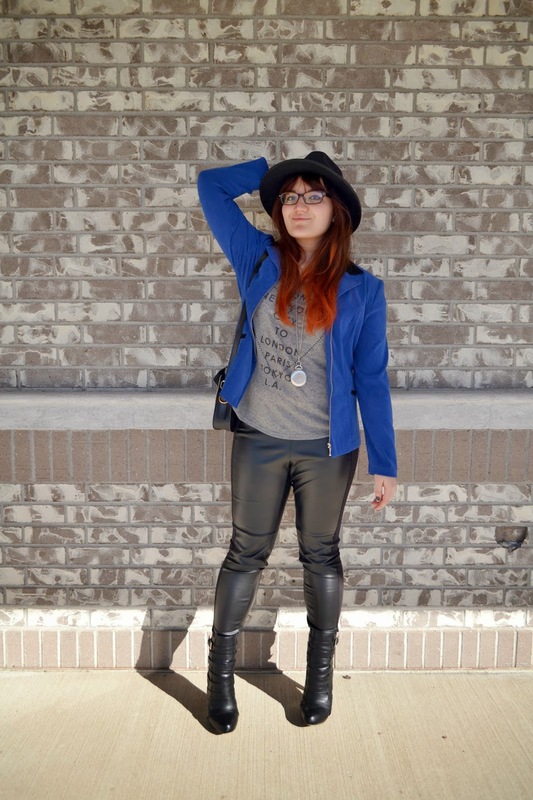 Love the blue blazer and boots and agreed, those black boots just add that extra bit of sassiness. The poem is a brilliant effort, so well thought up and deserves an A! Glad I'm not the only one--I've done this a couple times with taller wedges. 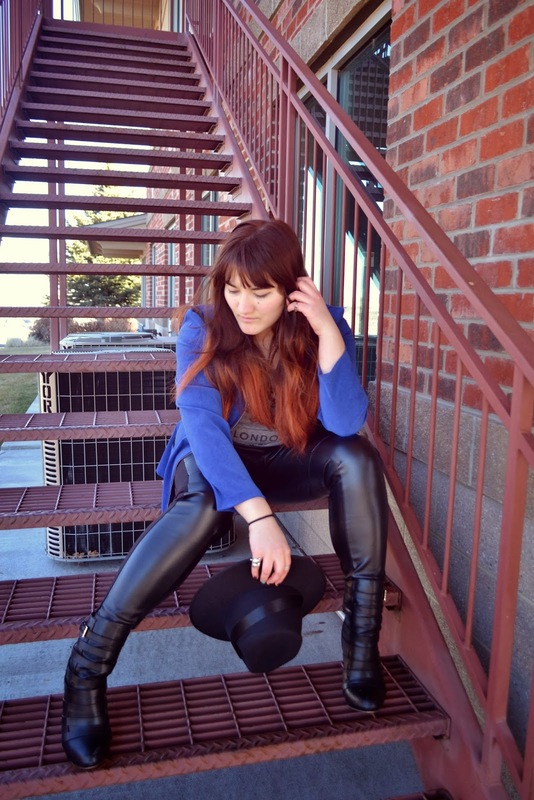 But your outfit looks equally stylish with the blue boots and black ones--I like the balance of the blue ones with the blazer but the black ones add that certain edge. Anyways, I'm totally digging your new hair! The color is so vibrant! And I completely understand when you say you feel like a different person. I look back at old photos of me and see another girl. It's part of life I suppose--we're always changing. Have a great week, Linda! Those black boots are killer quality. Nice post. Love the blue blazer. And wowowow, love the day to night trick...those boots are amazing! Both of them! Oh, and tip for the remote...AMAZON...super cheap. Awesome bio poem Linda! I wish we had that when I was in school. So much fun. It definitely sums you up. Love the way you transition from night to day. Those black boots DO look awesome on you. Keep being you doll. 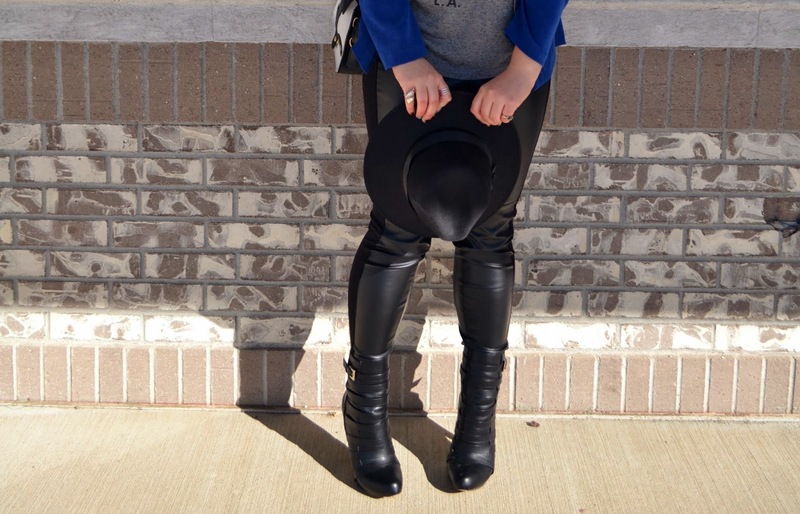 Those cobalt boots are killer! The poem is adorable! What a fun assignment, I am glad you embraced it. Your pants are great, and I love the splashes of blue!! awesome poem. =D That's not easy to write! I adore both shoes. Nice mix-up! I hate fade it makes me really sad when my hair isn't the perfect colour- unfortunately I solve it by dying my hair every 3-4 weeks. i used to do this too! but now i'm just too lazy to switch aspects of my outfit haha, aint got time for that :P i love this look with both shoes though! amazing outfit, wonderful shoes and leggings! 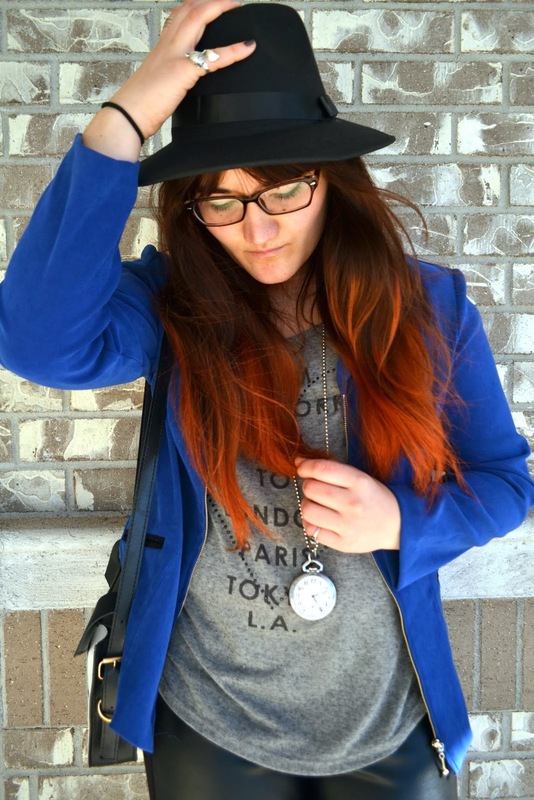 Totally - that blue blazer in combination with your red hair is just amazing! Perfect day and night outfit! Just one swap and you are ready for a great evening! wow this outfit is amazing, so edgy and cool! and omg i swear i do that all the time, i just carry a little canvas bag with a change of shoes everywhere haha! glad im not the only one, definitely a fashion blogger thing! I completely understand you about the shoes issue. Your outfit is wonderful because you can change it for day or night :) I love your blue shoes. This post pretty much sums up your awesomeness, Linda! First of all, best poem ever! You're too cute and I totally agree with your need to travel. And then your outfit... gorgeous! 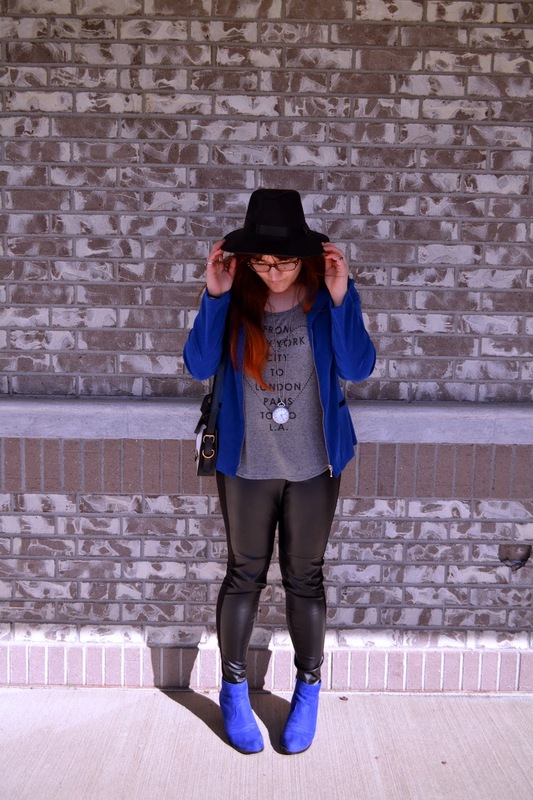 You look stellar in cobalt blue and those leather leggings are awesome! I couldn't decide which shoe I liked best either, they both look perfect with the ensemble! this is so true for bloggers!! shoes swapping!! i love the quick transition though! it's so nice how a small change can infuse that a different vibe. I actually LOVE both and i couldn't agree more with the hair! i really love how it stands out, beautiful! your bio poem is really fun to read. the last two lines hit just right! Great poem and great shoes. Can't ask for much more, really.